This set of services is part of the IPRE Myro package. Note: this readme is just for the Scribbler services and assumes the reader already has a working knowledge of Microsoft Robotics Studio (1.0). For more information on MSRS, please see: http://www.microsoft.com/robotics. Optional: A video card that can support the MSRS simulator. See: for http://channel9.msdn.com/wiki/default.aspx/Channel9.SimulationFAQ more info. A serial or Bluetooth link to robot. Run the IPRE Scribbler Services installer. When prompted for the installation directory, choose the default Microsoft Robotics Studio (1.0) installation folder. The Scribbler services will be placed under: C:\Microsoft Robotics Studio (1.0)\samples\IPRE\Scribbler. Pre-compiled .dlls will be placed under C:\Microsoft Robotics Studio (1.0)\bin\services so you can run the services right away without having to compile first. Python .dlls will be placed under C:\Microsoft Robotics Studio (1.0)\bin so there are no extra steps required to run the Python examples. Before you can use your Scribbler robot with Microsoft Robotics Studio, you must first upload a special server program to the robot. Connect the Scribbler robot to the computer using a serial cable and run the installation utility located at: C:\Microsoft Robotics Studio (1.0)\samples\IPRE\Scribbler\Basic Stamp Code\InstallServer.exe. The source code for this can be found in the same directory. The service architecture for the Scribbler robot follows MSRS standards and can be seen in the diagram below. In this diagram, the green box represents high level user code, the gray boxes are generic contracts provided by MSRS, and the blue boxes represent the code in this package. Typically, they are the only code that needs to be Scribbler robot dependant. In general, users will want to write high level services such as a wander routine. This is easily accomplished through the use of generic contracts. These generic contracts allow the robot specific hardware to be abstracted away. So your code should work on different robot platforms, as well as in the MSRS simulator! The high level service communicates to the generic contracts through standard notifications and 'Get' type messages. 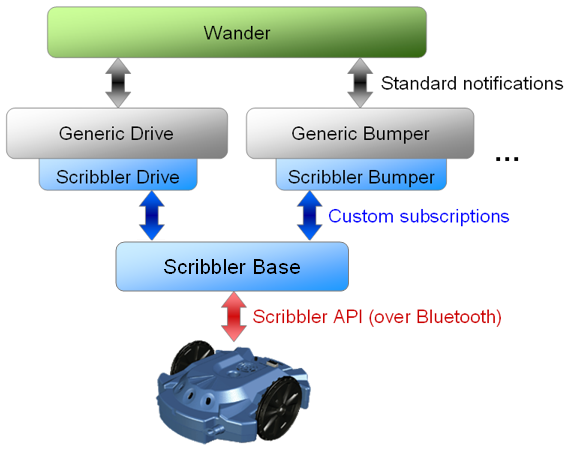 The Scribbler sensor services communicate to the ScribblerBase service though custom subscriptions. The ScribblerBase service handles all the communication to the actual robot and serves as the state of the entire robot in MSRS. These services can be found under: C:\Microsoft Robotics Studio (1.0)\samples\IPRE\Scribbler. They can be run by opening the Visual Studio project file and pressing F5. Although, it may be easier to use the batch files detailed in the next section. ScribblerBase - This is the lowest level Scribbler service that handles all the communication with the actual robot. ScribblerSim - Stands as the ScribblerBase service for the MSRS simulator. ScribblerBumper - Implements the generic ContactSensor contract. Monitors the IR obstacle detectors and the stall sensor. ScribblerDrive - Implements the generic Drive contract. Handles all motor commands. Note, there are some high level drive functions such as DriveDistance, and RotateDegrees that are not implemented for the Scribbler. This is because the Scribbler robot has no wheel encoders. ScribblerLightSensor - Monitors the 3 light sensors. Implements its own contract, but uses the generic AnalogSensorState. ScribblerLineSensor - Monitors Scribbler's line sensors. Implements its own contract. ScribblerBackupMonitor - Makes the Scribbler beep like a big truck when it backs up. ScribblerHeartBeat - Flashes an LED once per second. ScribblerLEDArray - Implements a new LED array generic contract. ScribblerToneGenerator - Implements a new tone generator generic contract. DrawSquare - An example of a high level service. Makes the Scribbler draw a square. LightSeek - An example of a high level service. Makes the Scribbler drive to the brightest light it sees. Wander - An example of a high level service. The robot will drive around and try not to bump into anything. Will also speak when it bumps into something. These batch files are included so that you can quickly and easily run the services above. To use, open a MSRS command prompt and navigate to C:\Microsoft Robotics Studio (1.0)\samples\IPRE\Scribbler\Batch Files. Then just execute the desired file. Turn the robot on before running this example. Will make the robot drive in a square pattern. NOTE: The robot's path is highly dependant on battery state, floor surface, and the individual robot. No need for a real robot. This will make the simulated robot draw a square. Will make the robot drive towards the brightest light it sees. NOTE: There is currently no simulated light sensor, so this does not work in the simulator. Runs the standard C# Robotics Tutorial 1 with the Scribbler. Put your hand in front of the scribbler and it puts some text on the console. Runs the Python version of Robotics Tutorial 2 with the Scribbler. Put your hand in front of the Scribbler and it turns on and off the motors. NOTE: There is no version of this tutorial in C# that can work with the Scribbler. 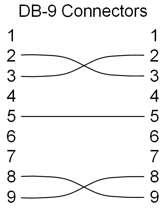 This is because it requires a generic motor contract which the Scribbler does not have. The Python tutorial 2 file used here has been modified to use the Scribblers generic drive contract instead. Runs the standard C# Robotics Tutorial 3 with the Scribbler. Put your hand in front of the robot to start the service. It will then drive around trying not to bump into things. Runs the standard C# Robotics Tutorial 4 with the Scribbler. An example of a win form to control the robot. Starts only the Scribbler base service. Not too exciting on its own. Starts the Scribbler base service with a bunch of extra services. Drive the Scribbler around with the Dashboard and you will notice the Scribbler's BackupMonitor beeping when you drive in reverse. A version of Robotics Tutorial 3 that is geared towards the scribbler. Should make it turn left, or right depending on the sensor pressed. Put your hand in front of the Scribbler to start it going. Simulated version of the Wander service. The Institute for Personal Robots in Education (IPRE) is a partnership between Georgia Tech, Bryn Mawr College, and Microsoft Research to apply and evaluate robots as a context for computer science education. Myro, short for My Robotics, is software that enables its user to program their own personal robot. It will be used as a tool of IPRE in the classroom to help boost enrollment and retainment in computer science classes. In this release, a C# interface is used to provide all the .NET languages the same Myro API . Please see the ScribblerControl project. An example program is provided that makes the Scribbler drive in a square. This can be seen in the ScribblerControl.cs file. To run this example, run the ScribblerControl.exe program located in the C:\Microsoft Robotics Studio (1.0)\bin directory. Scribbler base service will remember com port and robot name last connected to. The first time service is run, it scans all ports for a Scribbler robot. In any of the ScribblerSim examples, navigate a browser to http://localhost:50000/scribblersim. Then refresh the page to drop cubes into the simulation. In any of the ScribblerSim examples, you can view the world from the perspective of the robot by selecting "robocam" from the camera menu in the lower left of the simulator window. In any of the real-world Scribbler examples, navigate a browser to http://localhost:50000/scribbler to inspect the state of the robot. The Scribbler will make a distinctive chirp when it turns on. This helps you know when the batteries are getting low because the robot will reset itself. The Scribbler will beep once when MSRS connects to it. The Scribbler will toggle the center LED every time a command is received. When the robot is not connected to MSRS, it will blink slowly (on for one second, off for one second). When the robot is connected to MSRS, it will blink faster, (on for half a second, off for half a second). Make sure you gave the Bluetooth pairing a serial port profile. Go to Bluetooth devices, click on the device, click Properties, then go to the services tab. Make sure (SPP) "Generic Serial" is checked. Remove, then re-insert the Bluetooth dongle on the PC. If you have built in Bluetooth on a laptop, there should be a way to turn off the Bluetooth antenna, then turn it back on. Unfortunately, there is not much that can be done about this. The lag can mostly be attributed to the Bluetooth delay, but it is also partly our communication scheme. Because the BASICStamp in the Scribbler does not buffer incoming commands, we have to use an echo-based flow control. Type "localhost" without the quotes in the "Machine" text box. Then press "Connect". Double click "simulateddifferentialdrive/..." or "scribblerdrive/drive". If you have a joystick connected to your computer, you can use that to drive the robot by holding the trigger button and moving the stick. If you do not have a joystick, press the "Drive" button then click and drag on the sphere with the mouse. If it is a Microsoft Robotics Studio related question, then the MSRS forums are a good place to go. If it is about IPRE / Myro, then the myro-users email list is best.